Renting a vehicle in Australia is by far the best way to discover Australia if you don’t want to buy your own vehicle. When travelling in a motorhome, you will save money on hotel nights and you will have more freedom. However, costs for renting a motorhome in Australia vary. With the plethora of rental companies, it is sometimes difficult to choose. Find out everything you need to know about motorhome rentals in Australia at a glance. Motorhome rates vary depending on availability and season. Renting a motorhome can be quite expensive, especially if you are booking at the last minute. If you’re planning a trip to Australia or New Zealand, make sure you plan your budget in advance. If you book a motorhome three months in advance, it will probably be half the price of what you’d pay if you book a week before you leave! By the way, the longer you’re renting a motorhome the lower the daily rates. Newer and / or better equipped motorhomes are obviously more expensive. To give you an idea, a 4-seater motorhome can cost from $ 120 to $ 200 a day during the mid-season. In our opinion, the best comparison website for motorhomes in Australia is Motorhome Republic. It helps you to compare prices of different vehicles. You can even filter according to criteria such as desired equipment, number of passengers etc. It’s free of charge and you can easily book online. – Avoid picking up or dropping off your motorhome in a small town (they are more expensive). Prices from Broome, Alice Springs, Devonport or Dunedin in New Zealand are usually more expensive. – Avoid “one way” rentals. Campervan companies often charge one way fees (around 150 AUD). – Book well in advance. Prices go up depending on availability, so it’s always cheaper to book in advance. – Check where depots of rental companies are located. If they are far away from the airport, you will probably end up spending money on a taxi. – It’s worth renting a motorhome for a longer period of time, as daily rates usually decrease gradually. So for example, if you where planning on doing two trips in Australia, it might be cheaper to hire the same motorhome for the whole time. It is important that you’ll get insurance to cover any potential damages. The insurances offered by rental companies can be quite expensive. It is better to get an insurance from a specialised company like Rentalcover. An insurance for your rental motorhome costs between 9.30 AUD and 29.70 AUD per day – almost half of the price that rental companies charge. There are probably over 50 motorhome and campervan agencies in Australia. The most popular ones are the biggest companies, offering various brands and models. Here is a quick overview of motorhome companies in Australia. Apollo and Britz are the biggest motorhome hire specialists. Both of them offer a wide range of vehicles with different brands. For example, Apollo has “Cheapa Campa” for their mid-range vehicles, and Hippie camper for budget campers. Most popular high-medium budget companies are: Apollo, Kea, Maui, Britz and Cruisin Tasmania. As a reminder, we use the term “motorhome” (American RV) for autonomous or “self-contained” (equipped with a shower / toilet cabin) vehicles. 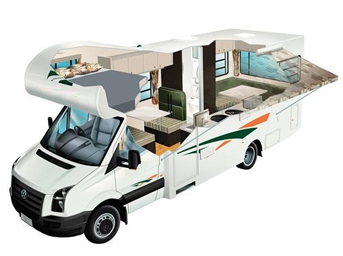 There are various models of motorhomes, from 2-seaters to 6-seaters. You will definitely find a model that suits your trip. If you’re travelling with children, remember to check the features of the vehicle to make sure it is suitable for your child’s age. Some vehicles don’t have anchor points, even if there are enough seats and beds that would fit your needs! 2-seater motorhomes (with toilet & shower) are usually made from the same manufacturer (Ford Transit, Mercedes Sprinter, Volkswagen Crafter). They all have pretty much the same layout, with a double bed at the back convertible into a sofa + table, and a kitchenette at the front with the shower cabin behind the driver’s seat. Thanks to its size, the 2-seater is easy to drive and consumes little petrol. As this model is not much bigger than the 2-seater, it can only accommodate a couple with a young child. 3-seaters are not really common. The 4-seater comes with two double beds and is ideal for a family with two children or two couples. However, it might be too small for a group of 4 friends. A large double bed is usually located at the front of the vehicle, convertible into a dining area. At the top, over the driver’s cabin, a second bed is set up. At the back of the vehicle, you have a kitchen area and shower/toilet cabin. Most popular vehicles are from Volkswagen or Mercedes. Those models are not really common. Although some companies such as Camperman offer 5 seater motorhomes, none of them have 3 beds. They only have 2 large beds and might not fit everyone. This is the largest model available and can comfortably fit 4 adults. With 3 large double beds there is plenty of room for a family or a group of friends. It’s also a great option when traveling with 4 people, so you can leave one of the beds set up as a dining area. Otherwise, you need to undo the bed every morning. You most likely arrive in Australia in one of the major cities like Sydney, Melbourne, Perth or Brisbane. It is pretty convenient if you want to hire a motorhome in Australia. Due to the high competition among rental companies, you can get better deals in these big cities. Remote locations such as Alice Springs, Broome, Airlie Beach or Townsville are not the best option though. As having a depot in those cities is usually not profitable for rental companies, it might be difficult to find available motorhomes and good deals. Motorhome companies are usually located in proximity to the airport. On the one hand, this location might not be ideal for travellers who where expecting to pick up a vehicle in the city, on the other hand, it is quite convenient for international travellers. In any case, you still need to grab a taxi or shuttle to get to the depot. The spots located right at the airport are usually for “car rental companies” and rather expensive. Hiring a motorhome in New Zealand is without a doubt the best way to discover this beautiful country!! It allows you to save money on accommodation and offers you freedom when it comes to seeing the lesser known areas of the islands. Most rental companies you know from Australia operate in New Zealand as well, mainly in Auckland and Christchurch. – Carefully inspect your motorhome for damages before you sign the contract (interior, cockpit, engine etc.). – Have a close look at your rental contract including the fine print (look for hidden fees). – Take photos, especially of existing scratches and small damages. – Ask questions when you pick up your motorhome. – Double-check that the vehicle corresponds to the model you booked. It can happen that the model you booked is no longer available. In this case, you get a different model. If this happens, you should be upgraded. – Ask for user directions (electrics, shower, toilet, bed, charging systems etc.). Make sure you know how everything works. – If you’re planning on driving in Sydney, Melbourne, or Brisbane, get maps and find out about the toll procedure. 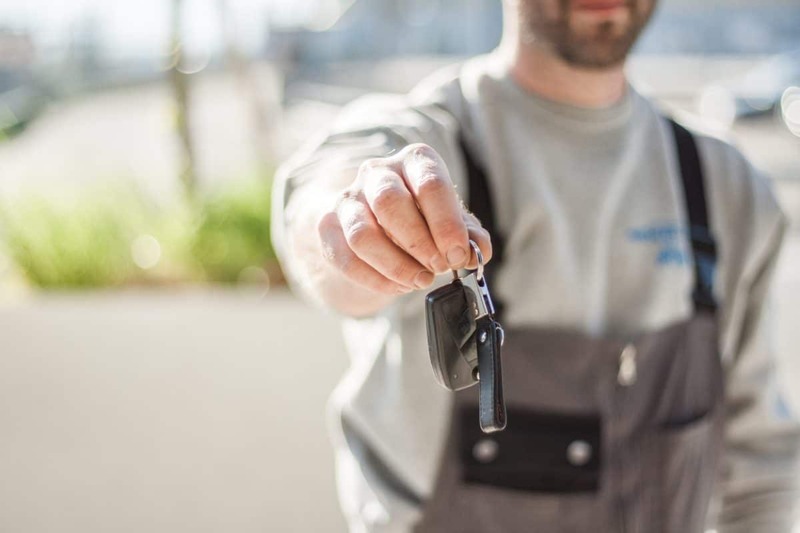 – Inspecting your Rental Vehicle – What to check?